Discover tips on how to be confident on camera and on how to increase your conversions. Discover how to be at ease on video, and much more. 01:11 – What is your big win lately? James Schramko here with an Internet Marketing news update. I’m going to be to be talking about OwnTheRacecourse – Reloaded, plus I’ll give you a video tip, and we’ll talk about wins. So last week in Fast Web Formula, I recorded a webinar called OTR re-loaded and I gave heat maps and analytics from my most recent results from SuperFastBusiness.com. 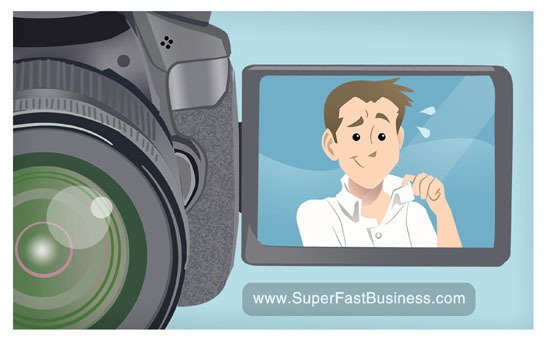 Be sure to check out the replay inside SuperFastBusiness. It will really help you fast track your conversions and get you that marketing exposure that you need for your business to grow. It will build your authority and will reduce your marketing expense. Now when it comes to videos, at first when you make them you don’t feel that comfortable. My suggestion is playback the video to yourself over and over again until you’re happy with it. There’s no point practicing in front of a mirror because you can’t actually get the feedback later, so record yourself on a camera and play it back. That’s the best way to improve and of course doing it over and over again will get you the ability to be able to refine what it is that you’re doing that you need to fix. What’s your big win lately? One of the most inspirational threads this week inside Fast Web Formula is about Wins. What’s your big win lately? One of our members reduced from 10 websites to 1 and I know the power of that simplicity. One of my wins was being able to set-up a new studio with fast internet which I’m very-very excited about. What were your big wins in the last week or two? Perhaps you could comment right near this video. I hope you’ve enjoyed this news update. I’m James Schramko, see you soon. Loving your new background James! Looks amazing. My big win this week was launching my first video, ie the first video with me in it!! Feels great to finally start getting it out there!! It is the video our clients see after they sign up for a trial….next up is the video they see to encourage sign ups, there is no stopping me now!!! Dave well done! A good on-boarding process should help conversions. Best of luck!